Feel free to report any bugs ! Its a biome using custom terrain, with some arch inside. Softer Pics, you can change the pic size as you want, just try modifying the "baseMultiplier"
Like an elephant cemetery with bones block and some magma blocks. Mushroom cow are spawning too. I tried here to make a Fantasy Forest, with some waterfalls, lake, and even floating island Just walk in the hollows of the valley and see the water falling The water is adjustable in the json, if you want more or less waterfall. 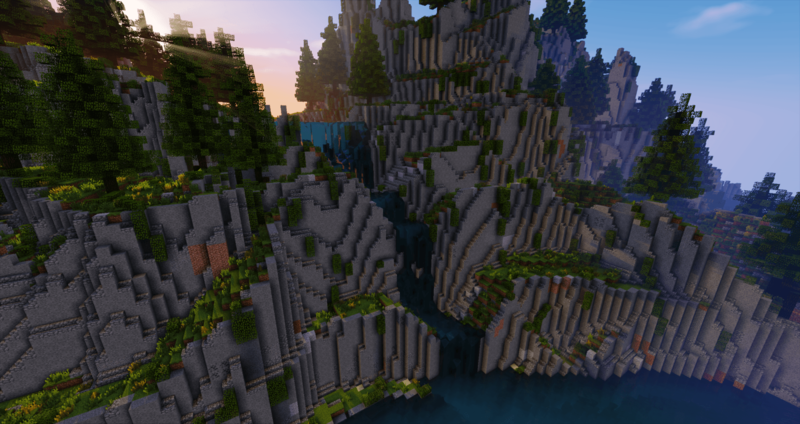 This biome is better by night, it looks scary, and is made with the custom and EWG terrain mix. Looks amazing. Would you like to get this implemented in the plugin in the "/ewg createworld" command? These look so cool! I can't wait to see what else you come up with. Great job. scabbed Default EWG terrain interact directly with the noise and is therefor able to do a bit more. The differences is small, so most of the terrains should be possible to create using default MC. If you have any tips on how I can implement more features in the current custom terrain section without making to complex, please tell me. scabbed Sounds like a good idea, I will do so when I get some extra time. When i add the biomes. Any tips? i launch the game, create a new world /ewg createworld map , and choose the first option. Oh is there any problem with ore generation? I want to render a full map, and need it to be good for launch.